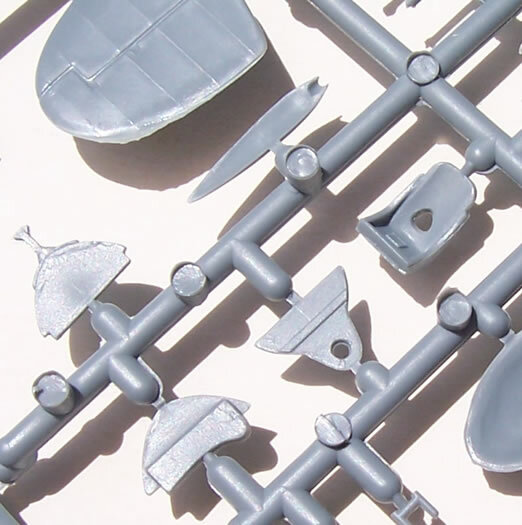 35 or 39 x styrene airframe parts, 2 x clear styrene canopies, 6 x resin engine and gun parts, and decals for four Gladiator or three Sea Gladiator schemes. 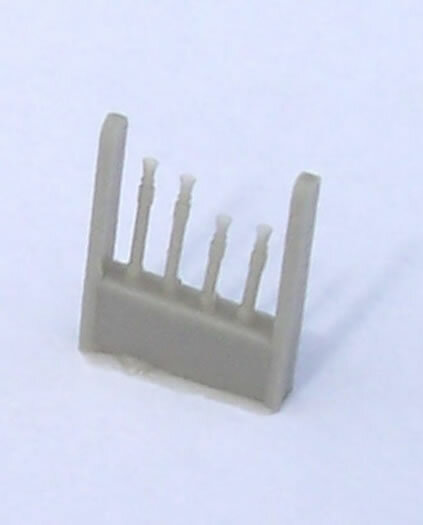 Good quality mouldings, fine panel lines and good detail levels for the scale. Unclear guidance on canopy choice. Excellent kits of an attractive subject. Initially developed as a private venture from the Gloster Gauntlet, the Gladiator was subsequently adopted by the RAF during its expansion period leading up to WW2. It was to be the last British biplane fighter. It first flew in late 1934 and remained in production until 1940. Three major versions were produced, these being the MK I, Mk II and Sea Gladiator. The Gladiator was quite an export success, and was involved in numerous areas of conflict. These covered from Finland and Norway, to Belgium, France and the UK, to Greece, the Mediterranean and North African theatres where, aside from Axis adversaries, it also clashed with the Iraqis and Vichy French. It also served as far afield as China, and a handful of captured Latvian machines were even flown by the Germans. Its fortunes varied, in some instances being completely outclassed and suffering heavy losses, yet in other situations it held its own and became the mount of several aces. Perhaps it is most famous for the defence of Malta where for a 10-day period three Gladiators called Faith, Hope and Charity are said to have defended the island from air attack alone. In fact there were more than three aircraft, most if not all being Sea Gladiators. The three names came into being after this period. But the reality was thate numbers of serviceable Gladiators at any given time in this period was very small, with Malta’s population often only ever seeing three gladiators in the air together at any one time. Regardless, the real defence mounted by just a few Gladiators was no less gallant than the semi-mythical account of Faith, Hope and Charity. I am aware of five previous Gladiator kits in 1/72 scale, and have owned all but the Frog one at some stage. 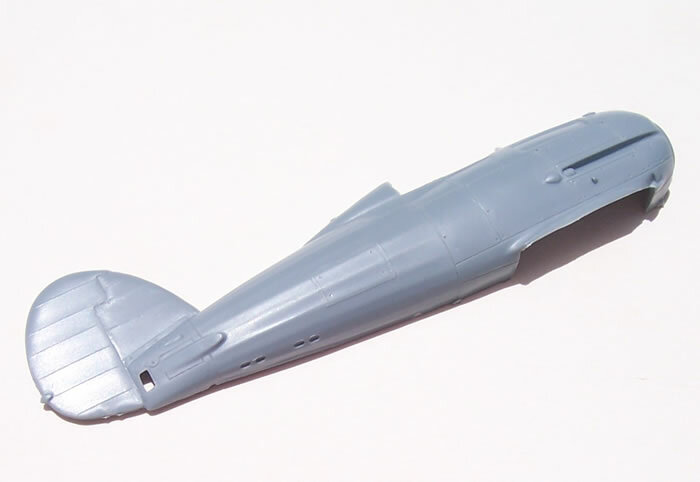 The earliest was by Airfix in 1956 and was a very simple affair with the pilot’s head moulded into the fuselage halves. Then came one by Frog, I think it was first released in the late 1960’s. A detailed build article in Scale Models Magazine, Feb 73 is quite praiseworthy of this kit, but it would be showing its age today. It has been re-boxed by Remus and Novo. 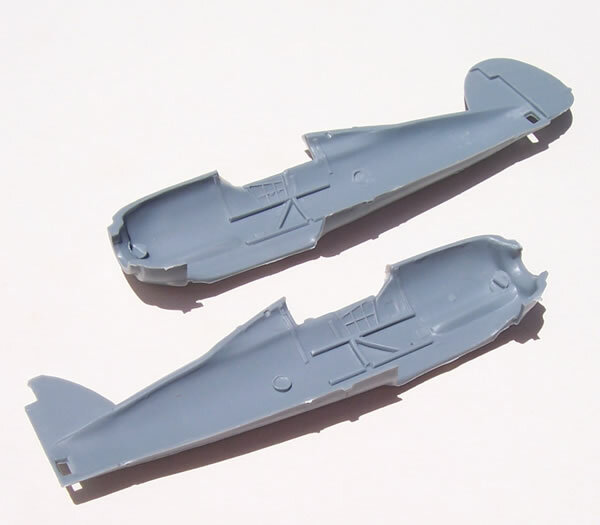 Both Airfix and Frog kits are now fairly rare collectables. I don’t know which kit came next, Matchbox’s 1973 release or the Heller’s for which I have no date. For me the Heller kit has the edge, despite some fabric texturing, with superior detail all round, although replacement decals are often needed. 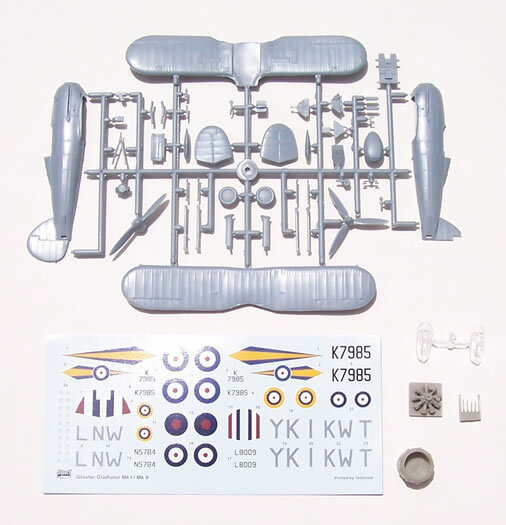 This said, the Matchbox kit was, like many Matchbox biplane kits, much more refined and generally superior to many of their other 1/72 plane kits. Needing some minor corrections for dihedral and aileron chord, this kit can build into a nice model. 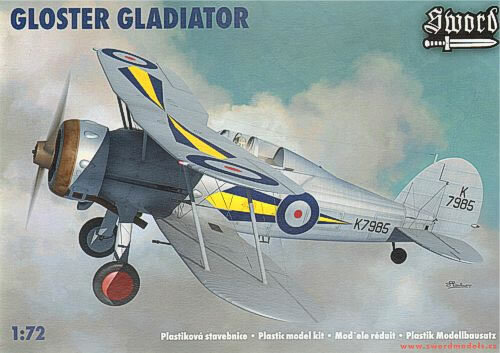 The Matchbox kit has since been re-boxed by Revell Germany, whilst Heller’s Gladiator appears not to be in their current line-up. More recently, from about three or so years ago, was a tour de force Gladiator/Sea Gladiator kit from Pavla, with a lot of resin detail and several decal options. This builds very well, but is still a true limited-run affair, and perhaps a little expensive for some. These days it is no longer listed on Pavla’s website and can be hard to find. 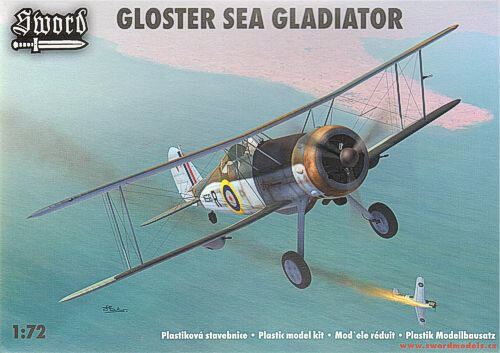 So Sword’s release of modern technology Gladiator/Sea Gladiator kits, with less resin than Pavla’s and consequently a lower price, will be welcomed by many. The kit comes in a typically Czech end-opening box with attractive artwork on the front. The instructions provide a parts map, and easy to follow diagrammatic assembly format. There is also a brief history of the aircraft. Text is in Czech and English. Painting and decal guides are quite adequate black & white shaded four-view drawings. 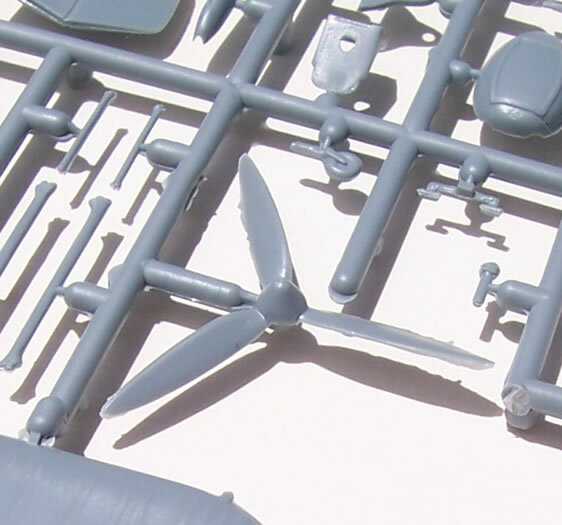 Generic colour call outs are provided for detail parts and RAF/FAA paint names for the airframe. 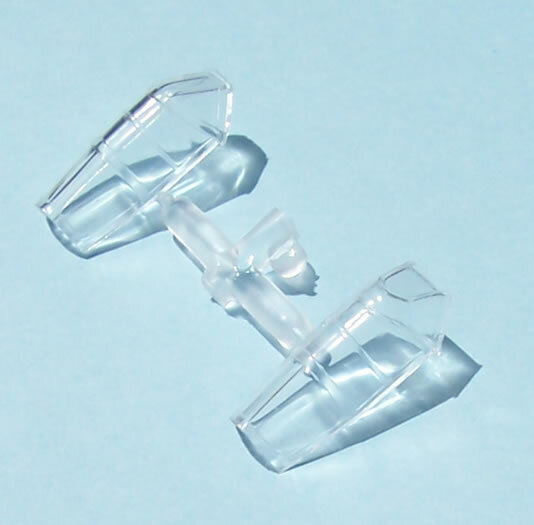 The parts come in a zip-lock bag, with the resin and clear parts further protected in their own small bags. I have numerous Sword kits, and this one is quite typical of the brand in that the plastic has a more shiny finish than many other Czech limited run brands. 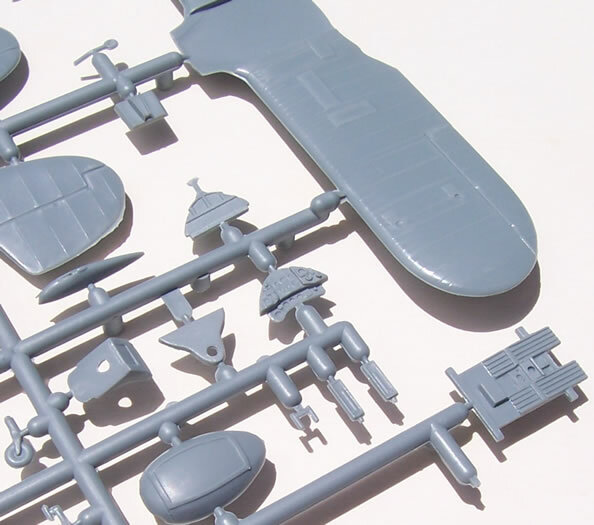 All parts are well moulded with fine surface detail, and the parts break down is conventional, with narrow sprue gates. Some flash is visible in many places but will be easily dealt with. 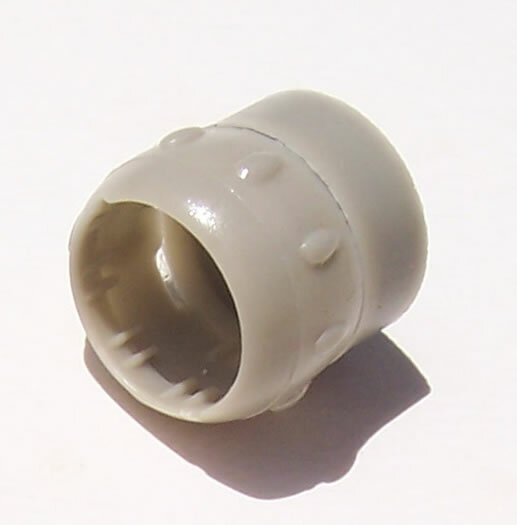 The resin parts are also produced to a good standard. Internal detail is moulded on the cockpit sidewalls. The instrument panel and overall cockpit detail is good for the scale, and captures the look of the original. However there are no seat belts. A resin seat with harness would have been a nice addition. This is a small complaint however. 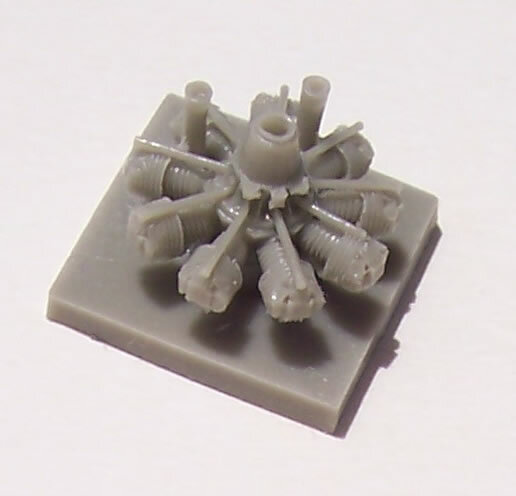 The resin parts include a very nicely cast engine, a cowling which pleasingly includes the internal exhaust manifold leading to the collector ring (something often overlooked), and some superbly done gun barrels. Two injected canopies are provided, one is the original type of windscreen, and the other the armoured type with additional bracing. Both are clear and acceptably thin. Far less clear however is which canopy to fit. The instructions are of no help here as all colour schemes are drawn with the un-armoured windscreen. I have seen this type used on all versions of Gladiator, so it’s probably a fair bet that the armoured windscreen will apply to some late-service Gladiators (when the value such things had come to be appreciated after the first year of war). It’s a case of checking references for the aircraft you’re modelling. 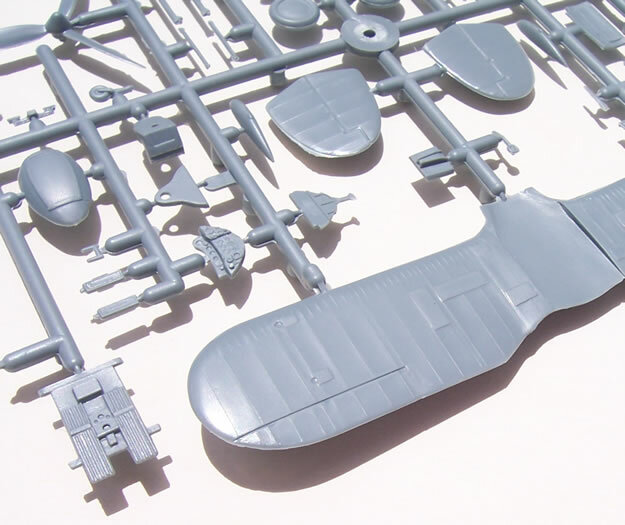 The tooling has been designed to cover both RAF and FAA versions with the slightly different sprues for the Gladiator and Sea Gladiator. 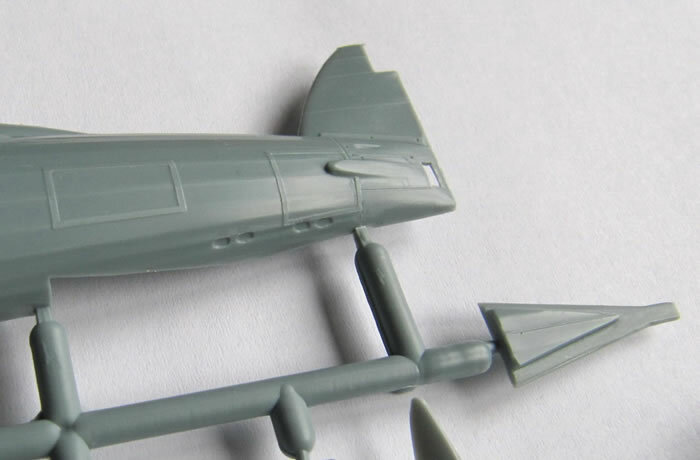 The difference is in the fuselage halves supplied, the Sea Gladiator’s coming with a cut-out and insert for the A-frame arrestor hook. 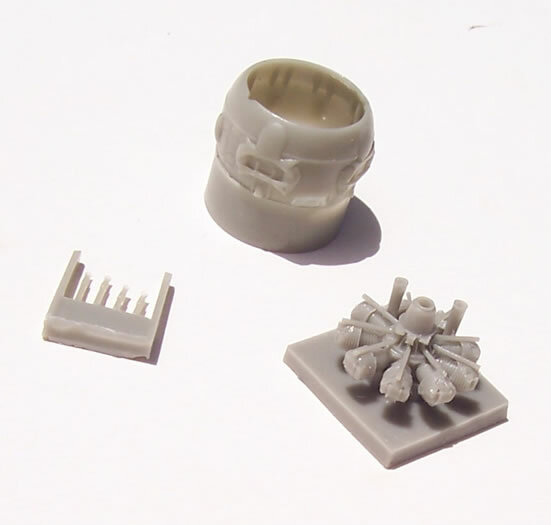 Some other Sea Gladiator parts are common to both sprues. This is a nice touch as no fuselage surgery is required to make the Sea Gladiator. Aside from the obvious different parts for the Gladiator/Sea Gladiator options, there is also a choice of 2 and 3-blade props, temperate and tropical air intakes, and a choice of canopies with different windscreens. Which prop to fit is easily determined by the colour scheme selected, the same method determining the selection of air intake. One observation I will make about props is that Sword have done a much nicer job of the MK II’s blades than Pavla did. 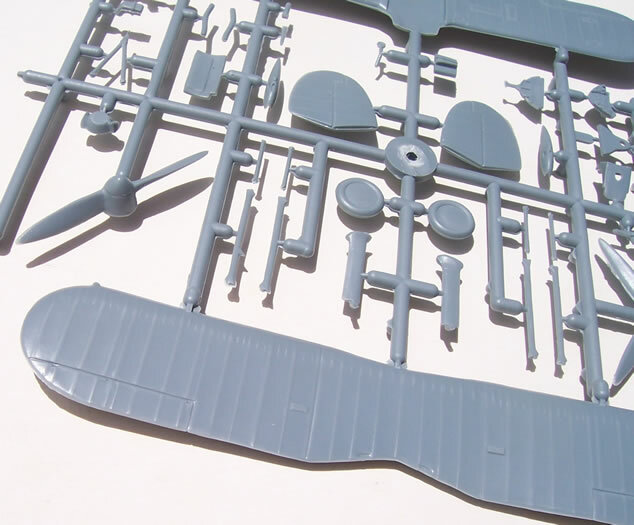 Construction sequence and parts breakdown is conventional for the type, and the kit looks as if it should be a very straightforward build, giving due regard to the fact that biplanes are generally more demanding than monoplanes. 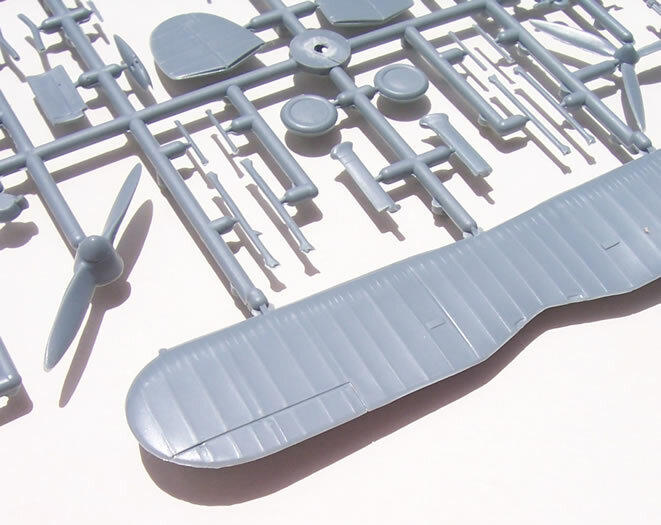 In this respect the kit is inferior to some of the earlier kit examples quoted, as the cabane struts are not moulded with the fuselage, something that can assist with fixing the upper wing’s position. This is probably just a reflection of Sword’s tooling limitations, and would apply to many other brands using similar moulding technology. Four decal options are provided for the Gladiator, one is overall aluminium and the other three camouflaged. The Sea Gladiator boxing offers three choices of an aluminium aircraft with very colourful markings, and two camouflaged aircraft. Decals look to be well registered with good opacity. These are nicely engineered kits produced to high standards with good levels of detail. The two kits are essentially the same, and should build well to result in very nice models. The lack of guidance regarding canopy choice is a pity, but not a major issue. There are a huge number of attractive colour schemes for Gladiators covering numerous different countries and air arms. Given their past practice, it seems likely that Sword will issue further boxings (my money’s on some of the Northern European nations). Meanwhile there’s a good opportunity here for after-market decal makers. 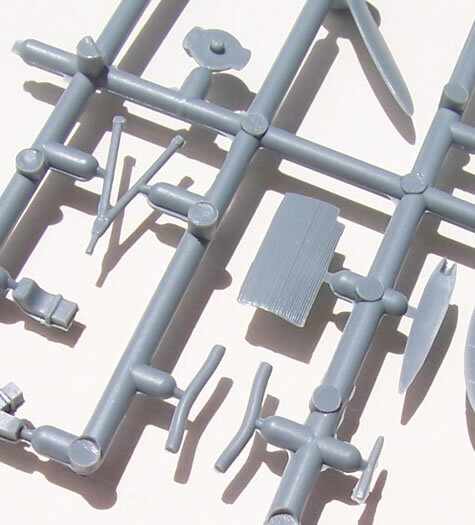 Affordable, readily available and good quality, these Sword kits will be the answer to many 1/72 Gladiator modellers’ prayers. Highly recommended.